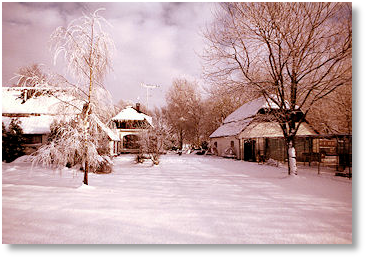 For us, Kolyma Kennels began in earnest at the Heershoeve in Harskamp, the Netherlands. Here is the house and the kennel buildings. 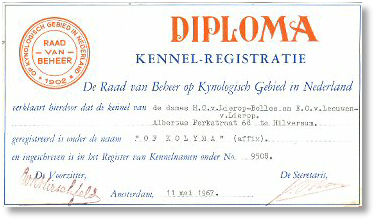 And here is the official kennel registration issued to us in 1967. Below are links to further pages with specific information about the Kolyma Kennels. Our Anadyr Dogs - the dogs we imported from Alaska to start our breeding program. Our Seppala Dogs - these dogs enlarged and improved our gene pool considerably. Our Other Dogs - the dogs we imported from other kennels. Our Kolyma Dogs - here you see the result of our efforts and the litters we bred. Our Breeding Program - here I explain our breeding principles. Our Training Program - how we trained our dogs. Our Teams - our dogs in action! Kolyma Photo Album - many pictures I want to share with you.